Principal Investigators: James Determan, FAIA (Hord Coplan Macht) and Mary Anne Akers, PhD (Morgan State University) With help from the Salk Institute and Terrapin Bright Green, the team will create a biophilic classroom using patterns and shapes from nature, as well as improved views and natural lighting. The performance of students in the classroom will be measured over time to examine the relationship between biophilic design and the success of the students using it. Principal Investigator: Kyoung-Hee Kim, PhD (University of North Carolina at Charlotte) How can algae be integrated into facade systems? That’s what Kim’s team is trying to find out, and the project will involve prototyping a microalgae facade and codifying best practices for using it in the future. 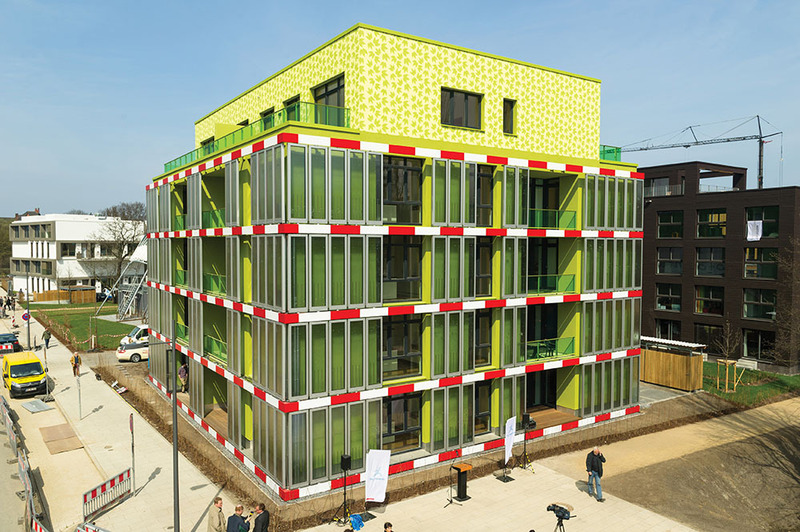 These “live facades” have been used to generate heat and algae biomass in past small-scale projects successfully. Principal Investigator: Keith Van de Riet, PhD, Assoc. AIA (University of Kansas) What are passive architectural systems that architects and designers can use without needing to expend operational energy? Van de Riet’s team will study the integration of biodiversity requirements into the criteria for high-performance passive systems. In this case, a full-scale living wall panel will be installed over an existing seawall in a tidal estuary. The integration of living systems with the built environment will be monitored for both the health of the panel as well as its performance in a stressful, real-world situation. Principal Investigators: Tsz Yan Ng (University of Michigan) and Wesley McGee (University of Michigan) 3-D printing concrete has been used to great effect in producing boxy structures, but Ng and McGee will be researching how complicated wall panels can be produced in the same way. The process should theoretically allow wall panel systems to be produced in a variety of shapes and sizes, but the novel, geometric designs will need to be performance-tested before they can be used in the field. The team will also be looking into how 3-D printed panels stack up to precast-produced pieces. All of the previously published Upjohn research can be viewed here. 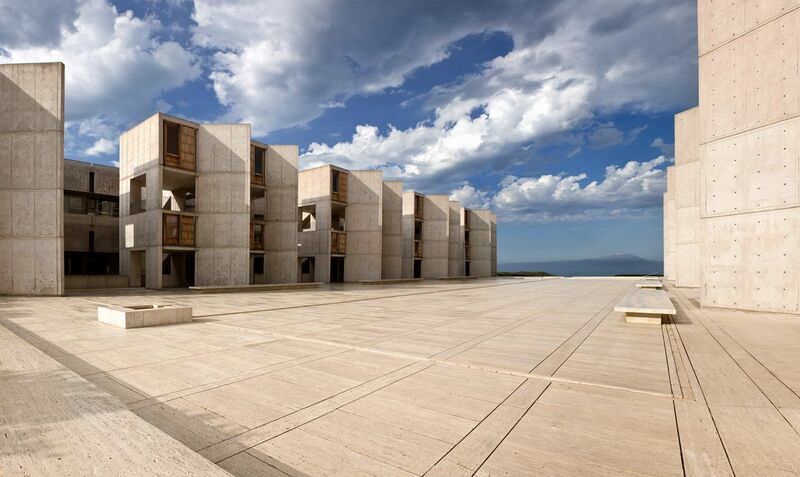 The Salk Institute announced yesterday that it is launching a new preservation-focused endowment called the Architecture Conservation Program, which will be designed to facilitate the restoration of the Institute’s Louis Kahn–designed headquarters in La Jolla, California. The announcement comes as the Institute completes work on limited conservation efforts aimed at restoring the nearly-60-year-old complex. For the project, architects Wiss, Janney, Elstner Associates, Inc. of Pasadena, California replaced and rebuilt the building's iconic teak wood exterior paneling systems. The $9.8 million restoration was funded by the Getty Conservation Institute’s Conserving Modern Architecture Initiative and will extend the lifespan of those components by another 50 to 70 years, according to a statement. The organization also recently completed a comprehensive conservation management plan for the complex that was funded by the Getty Foundation’s Keeping It Modern Initiative. But still, the improvements will not be enough to halt time’s slow and steady grind. Anticipating the Institute’s future preservation needs, Elizabeth Blackburn, Salk Institute president, said, “Despite the wonderful success of the teak restoration, the Salk Institute will continue to need care as the years go on.” She added, “Our next project will be restoring the concrete of the buildings, which is beginning to wear.” To aid in the restoration, the Institute has created an unspecified endowment to fund the “future needs of this beloved masterpiece,” said Elizabeth Shepherd, wife of Jonas Salk's son, Jonathan Salk. (Sheperd and Salk have made a "lead gift" toward the new program, according to the Salk Institute.) No word yet on how much money will ultimately be allocated to the restoration of the complex's concrete components, nor has a timeline been established for these improvements. For more information, see the Salk Institute website. The Getty Conservation Institute (GCI) announced this morning that after three years of research, construction is currently underway on a series of architectural conservation efforts aimed at restoring the luster of Louis Kahn’s seminal Southern California work, the Salk Insitute of Biological Studies in La Jolla, California. The GCI is providing research and funding to enact necessary site repairs and develop a long-term conservation management plan at the 51-year old complex, widely considered to be one of Kahn’s masterworks. 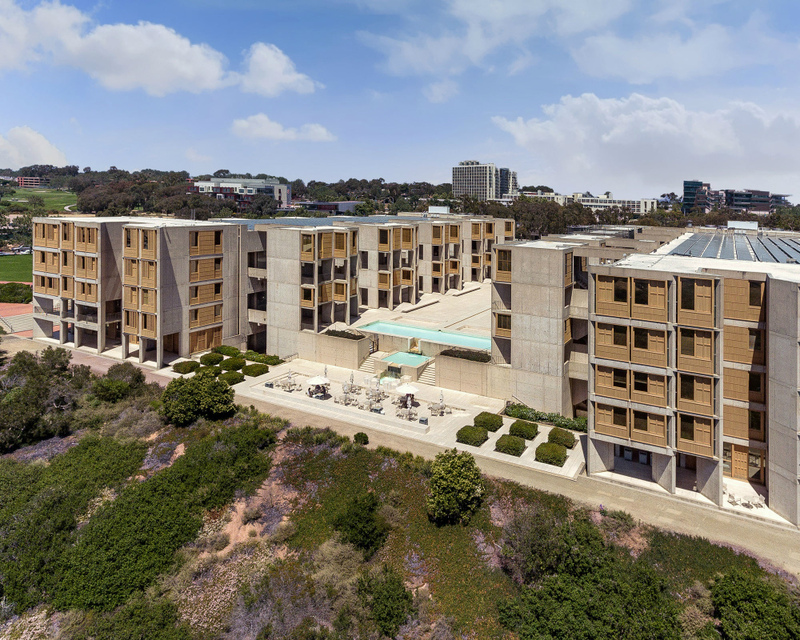 The complex is designed as a series of laboratories and offices overlooking a central courtyard facing the Pacific Ocean; its buildings are articulated in monolithic concrete walls and outfitted with custom-made teak windows. Kahn was originally commissioned to design the complex in 1965 as the new research base for the man credited with developing the polio vaccine, Dr. Jonas Salk. The Institute’s beachside locale has resulted in extensive deterioration and a “non-uniform appearance” of those distinctive teak elements, which number 203 in total. Each window assembly was prefabricated by carpenters in accordance with a highly-customized fenestration regime for the building, with each aperture offering varied combinations of sliding window panes, louvres, and shutters. Research conducted by the GCI team discovered that the window walls were suffering from particular forms of deterioration resulting from the presence of a fungal biofilm growing on the frames, exposure to the elements, and the detrimental effects of prior maintenance efforts. Not only that, but researchers discovered that the windows also suffer from moisture infiltration resulting from a lack of flashing and weather stripping and, additionally, the outright failure of weather sealants. Over the course of their studies, researchers coordinated their efforts by studying original documentation in Kahn’s archives, performing laboratory analysis on in situ materials, and eventually developing full-scale mock-ups of the windows to test conservation approaches. The conservation work, executed by Wiss, Janney, Elstner Associates, Inc. of Pasadena, California, was launched in 2013. Now that research has concluded, construction has begun and the project is due to finish in the spring of 2017. London-based Peter Inskip + Peter Jenkins Architects are consulting on the project as well. Both teams worked on the recent conservation work performed at Kahn’s Yale Center for British Art in New Haven, Connecticut. The initiative to restore the architectural masterpiece was coordinated as part of the GCI’s Conserving Modern Architecture Initiative, a project that has also overseen conservation management plan for the Charles and Ray Eames House in Malibu, California. It's funded by the Getty Foundation’s Keeping It Modern Initiative. Tim Whalen, director of the GCI, commented on the iconic nature of the project, saying, “The Salk Institute is an architectural icon, and the Getty was privileged to be invited by the Salk to work with them on the building’s long-term preservation. Our access to the site, its archives, and the Institute’s staff, some of whom have worked there since the early years, has been extraordinary,” adding, “The methodology developed by the GCI will serve as a roadmap for future conservation projects at the Salk Institute, as well as a model for other Louis Kahn buildings and buildings with similar conservation issues.” A special lecture regarding the GCI’s conservation efforts at the Salk Institute is scheduled for October 5 at the Getty Center in Los Angeles. That talk will be the first of many Kahn-related events occurring across the Southland this year, complementing a career retrospective on Kahn, Louis Kahn: The Power of Architecture, hosted by the San Diego Museum of Art, set to open November 5, 2016, in San Diego. The Center for Architecture is known for programming variety, but last Thursday night's premier of Architect: a chamber opera was a first. Granted, the film premier benefiting the CFA Foundation wasn’t live opera, but it was the first time the public got to hear the piece by Lewis Spratlan. The Pulitzer Prize winning composer's music was paired with electroacoustical music by John Downey and Jenny Kallick, whose process involved "sound sampling" spaces designed by Kahn, such as the Salk Institute in La Jolla, California. Spratlan's music was then electronically "placed" within the various spaces. For all the electronic bells and whistles, the piece is fairly traditional, albeit inflected with modernist leanings. Classic operatic devices could be found throughout, particularly in the character of a trickster god called Momus, a minor deity thrown off Olympus. The trickster morphs into the Guide, the Engineer, and the Healer, all of who conspire to get the architect away from the Woman, in order to create buildings that flatter the gods. Given Kahn's unconventional personal life--various children from various lovers and a tragic demise at New York's Penn Station--playing off the personal drama would seem an obvious choice. Instead, the team obliquely focused on the architect's struggle to realize his vision, opting for a universal theme that transcended the medium and artist. 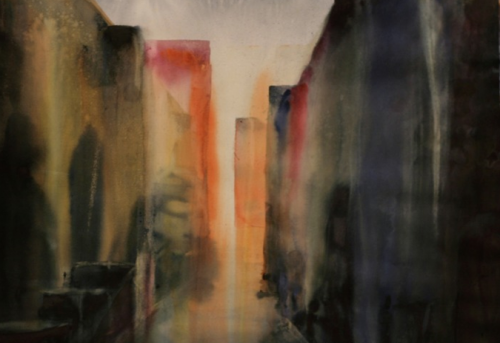 The film intersperses relatively few images of Kahn’s buildings with watercolors by artist Michiko Theurer. and photographs of Rome’s crumbling ruins, partly inspired by Edgar Alan Poe's poem, "The Coliseum". Even images of Gaudi's "La Sagrada Familia" find their way into the cross fades. The creators traveled to Eternal City, to several Kahn buildings, and worked together at Yale where the architect’s Art Gallery and Center for British Art loomed over the process. For opera designer John Conklin the work evoked Debussy’s Pelléas et Mélisande. Kallick's libretto eschewed archi-speak in favor of conversations between Kahn and his collaborators, such as this statement to the Engineer: "Dear August [Komendant] why does everyon pull me down?" "You are a dreamer not a fighter," replies the engineer. This kicks off an ode to concrete duet, that's clearly the opera's show-stopper: "Mix and cure it with the right vibration," goes the oft repeated refrain. And finally, the words every engineer wants to hear from an architect: "Your genius has made my buildings your buildings." Part of what makes Architect intriguing is the colaborators cross polinization into other fields. Spratlan wanted to be an architect before becoming a composer, Theurer is trained as a violinist, and Downey is studying radiology at Stanford. Later during the panel discussion, Kahn’s daughter Sue-Ann Kahn, said that the piece was an allegory for any artist’s struggle. “Either the gods are helping them or crushing them,” she said. Having Conklin on hand turned the post-screening panel into a virtual workshop. Conklin, having seen the video before, simply listened to the piece apart from the imagery. He said that while the ethereal images worked well on video, live opera was another matter. He thought much of the abstraction could be retained, but he envisioned scenes between the Architect and the Woman played in a banal kitchen. He also suggested bringing the small orchestra, there are only seven players, onto to stage to become part of the action. The video will be released with the CD in Spring 2012 and the creators hope to perform the production live at a Kahn-designed site. The idea intrigued AN's editors, who suggested Dacca, the more cost and acoustically effective auditorium at the Yale Center for British Art, or at the new Four Freedoms Park performed by the homeless City Opera. As Sue-Ann Kahn pointed out during the panel discussion, the delayed memorial exemplifies the artist's struggle to see their work realized.